The 39th Annual San Jose Day of Remembrance event commemorates the 77th anniversary of the signing of Executive Order 9066. The order led to the forced removal and incarceration of 120,000 people of Japanese descent during World War II. Hundreds of people will gather together at this annual event not only to remember that great civil liberties tragedy but to also reflect on what that event means to all of us today. Jimi Yamaichi cuts the symbolic barbed wire to officially open the Japanese American Museum of San Jose (JAMsj) in 2010. Pictured are Evan Yoshino (Applegate Construction), Mayor Chuck Reed, Jimi Yamaichi, Pam Yoshida (MBA Architects), Hiroshi Inomata (Consulate General of Japan), Aggie Idemoto (2010 JAMsj President). Photo courtesy of Andy Frazer. The day after I heard that Jimi Yamaichi passed away, I didn’t know what to do with myself. I felt a deep sorrow and emptiness. I viewed Jimi as a great mentor, a role model, an inspiration, and a friend. Jimi Yamaichi. Photo courtesy of Andy Frazer. Although I did not sign up to be a docent at JAMsj on that day, I felt that it would be better for me if I came into the Museum that afternoon. I had hoped to find solace with others who knew Jimi, but I also desperately wanted to remain connected with Jimi’s presence. Jimi put his entire heart and soul into the Museum and I can still feel his boundless energy, optimism, dreams, and passion in that space. Jimi’s relentless drive and determination are well-known by those who know him. We all have our Jimi stories on this topic. I remember one time when we were working at the Museum construction site when I found him lying face down by the quonset huts. He insisted that he was fine and that he “would get up in a few minutes after resting.” I performed a first-aid inspection on him and asked if he could feel me touching his arms and legs. He said that he didn’t and I immediately called for an ambulance. This was just several days before he was to lead tours at the Tule Lake Pilgrimage. I called a friend of mine who was on the Pilgrimage planning committee and told her that Jimi would unfortunately not be attending because of his hospitalization. To my great surprise, Jimi still attended the event, leading tours and giving presentations with two black eyes! Jimi and his wife, Eiko. Photo courtesy of Kristin Okimoto. Jimi was a very caring person. This is also true about his wife, Eiko, and the rest of the Yamaichi family. Since Jimi’s passing, I have heard numerous stories about how Jimi and Eiko took people under their wing, especially those that lost loved ones or individuals who were new to the community. I remember when I first met Jimi at my first Tule Lake Pilgrimage. I was new in the community and I didn’t know anybody as I sat by myself in the auditorium. Jimi came by and sat next to me. He immediately struck up a conversation and gave me some historical items that he had collected. Jimi made me feel very special. Jimi did that with everyone. Jimi was a runway model at the JAMsj Fashion Show in 2010.He forgot his belt and he feared that his pants would fall down during the show. I gave him mine but I had to keep holding my pants up while I struggled to take photos. I asked Jimi many questions about the Tule Lake concentration camp, the “No-No Boys”, renunciation, resistance, and dissent in the camps. Those are difficult issues that I still struggle with today. My family’s past actions do not fall into the overpowering, inspirational, and often repeated narrative of Japanese Americans who overcame their unjust incarceration through their great military valor, heroism, and patriotism. I had nobody who could explain at a deeply personal level why someone would take these controversial positions as my relatives were deceased, suffering from dementia, or were extremely reticent to talk about their past actions. Jimi understood my conflict. He thoughtfully explained to me the tortuous personal journey that he took in protesting his confinement. To my surprise, he later told me that he stood with my uncle in a Eureka courtroom where the Tule Lake resisters told the judge their side of the story. Through these conversations with Jimi, I began to understand that Jimi, my family and other dissidents did not hate this country and were not cowards, as some have called them. They simply wanted this country to uphold its very values, beliefs, and laws under the Constitution. Jimi Yamaichi helps Ruth Ishizaki light a candle for the Rohwer concentration camp at the 2008 Tule Lake Pilgrimage. Jimi created the remarkable camp display which has been used in ceremonies at the Tule Lake Pilgrimage and the San Jose Day of Remembrance. Photo by Will Kaku. One of my last memories of Jimi was at this year’s Day of Remembrance program, an event that I help organize every year. I came to his home the day before the event to pick up the beautiful candle lighting display that he created for the ceremony that honors Japanese Americans who were incarcerated during World War II. Jimi had just come home from the hospital after an illness. I told him that it would be better if he didn’t come to the event so he could fully recuperate. The next evening, I was shocked to see Jimi at the event. Somehow he willed his frail body to attend the program. His son, George, told me that Jimi felt that the event was very important to him and he insisted that George drive him to the event. I realize how physically strenuous it was for Jimi to make — what I now know– his final trip to the event. That really means a lot to me. Jimi at the grand opening of the JAMsj agricultural exhibit. Photo by Will Kaku. On the day after his passing, it was somewhat difficult for me to give museum tours that day since I always have several Jimi stories that I incorporate into my narrative. I had to pause or slow down a bit after I became a bit emotional. I still get teary-eyed as I tell those stories but I also know that Jimi’s spirit, vision, and dreams live on here at the Museum, in San Jose Japantown, at Tule Lake, and most importantly, within all of us. Jimi not only explained our history, he was also a teacher of life. Photos courtesy of Andy Frazer. May Matsuzaki, Aggie Idemoto, Leila Kubesh, Jimi Yamaichi, and myself during a presentation of the 120,000 Tassel Tapestry display created by Leila Kubesh and her students. Phrasing and word usage are very important in shaping our attitudes about people, events, products, issues, and policies. For example, according to a CNBC 2013 poll, more people were opposed to President Obama’s signature health care law when it was referred to as “Obamacare” rather than its official name, The Affordable Care Act. Similarly, in a 2017 IPSOS/NPR poll, more people felt that a particular tax should be abolished when it was referred to the “Death Tax” rather than the “Estate Tax,” which were common terms used during policy discussions. In my recent post about my visit to the Heart Mountain Interpretive Center, I referred to the Heart Mountain camp as a “concentration camp.” Some people feel uncomfortable with that terminology and believe that designation is reserved for the camps of the Holocaust. The following commentary is extracted from a display at the Heart Mountain Interpretative Center. My mother holds a photo of my father on the grounds of the Heart Mountain camp. Heart Mountain juts out in the background. The Heart Mountain concentration camp has always represented a critical turning point for my father’s family. As I had written in previous articles and speeches (links to some of these are below), Heart Mountain was the place where my father and his brothers struggled and debated as to how they were going to answer the infamous Questions 27 and 28. Heart Mountain was the location where my Uncle Tak decided that he was going to resist the draft. Heart Mountain was where my Aunt Itsu made a dramatic transformation from an innocent, acquiescent, and naive young women to one who became more aware of her dire situation and more vocal about racial discrimination and the violation of her civil rights. Local artist, Jack Matsuoka, states, “Discussion and debate on the questionnaire issue grew heated and not infrequently led to quarrels and fights. ” From Matsuoka’s book Poston, Camp II, Block 211. Despite that significance in my family’s history, I could never find the time to make the journey to the Heart Mountain Interpretative Center. During the fall, my mother told me she wanted to visit Yellowstone National Park, so I decided that I could finally combine that trip with a visit to the old camp site which is just an hour drive from the park. The Heart Mountain Interpretative Center opened in 2011, just a year after we completed the major renovation of JAMsj. Because I assisted in providing content for the JAMsj camp exhibit, I was fully aware of space, cost, and vision constraints that had to be considered in exhibit design. I was keenly interested in how the Heart Mountain Wyoming Foundation (HWMF) presented the Japanese American incarceration story to the public in their facility. One major aspect of the HWMF presentation, the first-person narrative, is extremely effective in bringing out an emotional connection to an infamous event in our nation’s history from over 75 years ago. After a short museum overview, my mom and I were encouraged to view the short film, All We Could Carry, by Oscar-winning filmmaker, Steven Okazaki. All We Could Carry powerfully captures the devastating impact of incarceration at Heart Mountain through the voices of former inmates. Several kiosks in the museum also incorporate moving first-person accounts. Exhibit placards continuously reinforce the first-person point of view by utilizing the inclusive pronoun “we”. We felt that we were also making our own journey through the great civil liberties and human rights tragedy from WW II. The 11,000 square feet of space also enables exhibit images and artifacts to extend out into the floor space, providing a fully immersive experience to the visitor. Every square foot of the museum is used to transport you back into the diverse and complex Japanese American incarceration experience. Even the reflective restroom toilet stalls convey the feeling of embarrassment and the loss of privacy that many former inmates experienced in the camps. Importantly, the museum exhibits challenge visitors with questions that are pertinent to our lives and political discourse today. One display asks us about what we think about the 14th Amendment and birthright citizenship. Another asks us if there are any circumstances under which the curtailment of civil liberties by the government is justified. It took us a long time to explore the many museum displays and my mother became tired. We came back the next morning and wandered around the self-guided walking tour next to the museum. We saw the locations of the Heart Mountain hospital where my father worked for a short time, the school that he attended, and the train station where my father boarded a train that transferred him to the Tule Lake camp. We walked solemnly during that quiet, cool morning and we reflected on his life. My mother holds up a photo of my father and his brothers who became political prisoners of this country for protesting their confinement. My father, Shogo “Bill” Kaku, at the Heart Mountain camp. A plaque honoring the memory of Eiichi Sakauye, who was also a founder of JAMsj, is displayed outside the Heart Mountain Interpretive Center. One of the goals of the Japanese American Museum of San Jose (JAMsj) is to preserve the unique history of our ancestors for future generations and to share their accomplishments and hardships with others. Japanese Americans can trace their roots to Japan. But their immigration to America, farming experience, and incarceration during World War II have combined to create Japanese American identity and culture. As a young girl, I recall my mother pointing out my grandfather as an example of gaman: persevering through difficult times with hard work and without complaining. Through his example I should learn these virtues. Because my grandfather was born in Oahu, Hawaii, at that time a U.S. territory, he was a dual citizen of the United States and Japan. The family came stateside in 1906, the year of the San Francisco earthquake. They were forced to move every four years because the California Alien Land Law of 1913 prohibited Japanese from owning land or possessing leases for more than three years. My grandmother was a picture bride from Kumamoto, a province on the island of Kyushu in Japan. Initially, my grandmother and her father were reluctant to have her travel to a ‘foreign’ country and unknown land. Her father later changed his mind. He told my grandmother that if she went to America and married my grandfather, they would return to Japan in three years. As it turned out, they never returned to Japan. My Grandmother Kajiu changed her name to Yoso, because Kajiu was also the name of my grandfather’s mother. And two Kajius in America would be too confusing. She took the name Yoso, her older sister’s name, who died earlier from a brain hemorrhage after working in the rice fields. According to papers, my grandparents were married in 1919, but my grandmother did not make her journey to America until 1920. She sailed out of the port of Nagasaki on the SS Persia Maru, the last ship for picture brides from Japan. The journey to California took 27 days, with a stop in Hawaii to let off other picture brides. Like many Japanese immigrants in Santa Clara valley, they worked as farmers. They grew strawberries and vegetables in Sunnyvale, San Jose, and Campbell while they raised their growing family. In about 1940, the family of seven children moved back to Campbell, where they lived in a tar-paper house with an outdoor furo (bath) and latrine (outhouse). The location of the property was on Union Avenue, not too far from the Pruneyard shopping center, which at that time was a prune orchard. During WWII, the family was incarcerated in the Heart Mountain Relocation Center in Wyoming. The family members traveled there by train with the blinds drawn down; they were not allowed to look out the window. Then they were transported in military trucks to the barracks. They saw their first snow ever, and to these Californians it was very cold. Their barracks had a pot belly coal stove in the middle and army cots for beds. The mess hall, bathroom, and washroom were in another building. There were blizzards in the winter and thunderstorms in the summer. After the war ended in 1945, my grandparents’ family members returned to Campbell. They were fortunate that their landlord, Mr. Whipple, had watched their house and belongings. But they had to start from scratch to get on their feet and earn a living. They picked prunes, prunes, and more prunes, because it was a family job, one in which everyone worked together. Later they became sharecroppers, growing strawberries with other white farmers. Growing up in Santa Clara Valley, our extended family traditions included mochitsuki, obon, and hinamatsuri. It is amazing that these traditions could survive through all the hardships of life in America. At JAMsj, these traditions are being carried forward so that future generations and the community can learn about their roots or the roots of their friends. Strong personal virtues and a sense of one’s roots can help develop your own identity and define who you are. And that is why we at JAMsj feel it is important to have programs and events to celebrate, commemorate, and uphold these traditions. For more information about internment camps and to view a replica of a camp barrack, visit JAMsj at 535 North Fifth Street in San Jose. Completely run and operated by community volunteers, JAMsj is open from Thursday through Sunday, 12 noon to 4 p.m. The admission fee is $5 for adults; $3 for seniors and students; and free to members, children under 12, and active military. We would love to see you. Please join JAMsj on March 1 for our annual hinamatsuri festivities. Children and their parents will be able to create items with paper, glue, and other crafting supplies. Hinamatsuri activities are fun, social, and open to the public. Adult helpers will be on hand to supervise these fun art activities. 35th Annual San Jose Day of Remembrance: Stories from the Past, Lessons for Today. 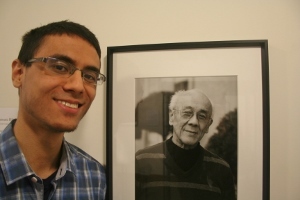 JAMsj docent, Kent Carson, stands before a portrait of his grandfather, Terry Terakawa, in the new JAMsj exhibit “Twice Heroes.” Carson will present his grandfather’s story at the 2015 San Jose Day of Remembrance event. The 2015 San Jose Day of Remembrance that will take place on February 15, 2015, commemorates the signing of Executive Order 9066, which occurred on February 19, 1942. This executive order led to the incarceration of more than 100,000 Japanese Americans during WW II. The theme for the 35th San Jose Day of Remembrance event is “Stories from the Past, Lessons for Today.” During the program, personal stories about the Japanese American incarceration will be told by descendants of those whose lives were deeply affected by Executive Order 9066. 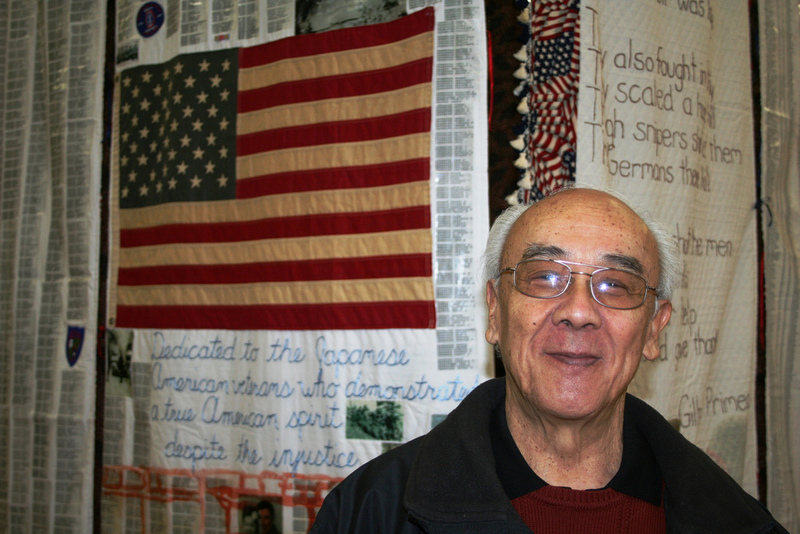 Kent Carson, a volunteer docent with the Japanese American Museum of San Jose (JAMsj), will be one of our speakers. He will recount the story of his grandfather, Terry Terakawa, who is also an active volunteer and a former board member of JAMsj.